In this file photo taken on July 13, 2018, Sayragul Sauytbay sits inside a defendants' cage during a hearing at a court in Zharkent, Kazakhstan. It was a place of silence, forced learning and fear. It was called a “transformation centre” hidden in the mountains of far western China, bereft of any obvious sign indicating its purpose. But it looked and felt like a jail. For months, Sayragul Sauytbay worked inside, teaching Mandarin and propaganda to Muslim detainees swept up in a broad Chinese campaign to eradicate what Beijing calls extremism. Then, facing internment herself, she fled to neighbouring Kazakhstan – where she was arrested after China sought her deportation. 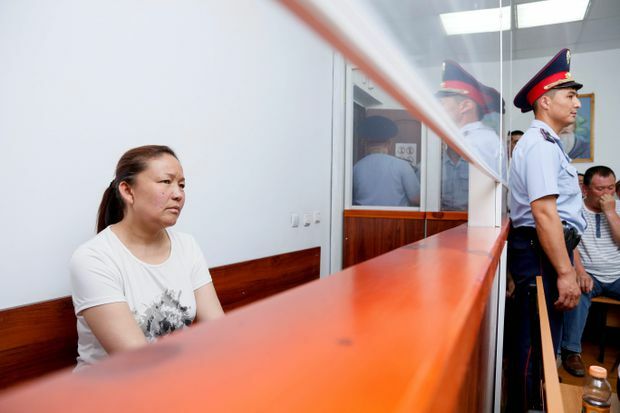 But her lawyers argued that she could face torture if returned, and on Wednesday, a Kazakh court declined to send her back, giving her a six-month suspended sentence. In freeing Ms. Sauytbay, an ethnic Kazakh, Kazakhstan rebuffed a powerful neighbour and allowed her to become the first instructor to publicly describe her experience in the re-education system. Her account buttresses the growing body of evidence about an extensive network of internment facilities that activists and some scholars have likened to military prisons. Chinese officials have not confirmed their existence. A primary school teacher who became a kindergarten administrator, Ms. Sauytbay was ordered last November to work in a new place. “They said I must go. I think if I refused them, I would have ended up being locked in that re-education centre as well,” she said. She had been chosen to teach inside the internment camp​ because she could speak both Kazakh and fluent Mandarin. Often, she was driven to work at night, to a distant place in the mountains of Zhaosu County, on the far western border between China and Kazakhstan. The facility was surrounded by high walls and barbed wire. It looked “very, very scary. Just one glimpse would frighten you,” she said. Inside were roughly 2,500 people, all of them Muslim, most of them ethnic Kazakhs. None were Han Chinese, the dominant group in China. “They were all ethnic minorities,” she said, ranging in age from their upper teens to their 70s. She received no explanation for why they were there, nor the purpose of the instruction she was ordered to deliver. She did not personally see violence, although she did see hunger. Detainees had only three kinds of food: rice soup, vegetable soup and nan bread. “There was no meat. There was never enough to eat. People were malnourished,” Ms. Sauytbay said. In her time there, she was not aware of any detainees being released. After four months at the centre, she returned to her kindergarten class. But a week later, she was removed from her position. Her husband and children had secured citizenship in Kazakhstan. That was enough to place her under suspicion. Instead, she fled to Kazakhstan where “she’s regarded as a hero by many people in this country,” said Kayrat Jawhax, a Chinese-Kazakh activist. Ms. Sauytbay said she was merely following her conscience.